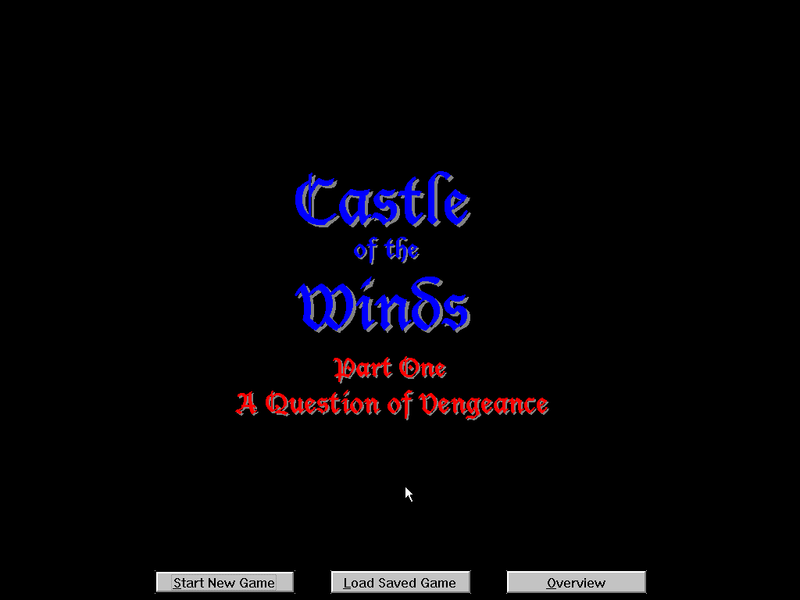 A roguelike from the early days of Windows, developed by Rick Saada in 1989 and eventually published by Epic MegaGames in 1993 for good old Windows 3.1. The game has since been released as freeware by its author, though you may need to run a virtual machine with an older version of Windows in order to play it, as 16-bit programs don't run natively on modern 64-bit operating systems. You can download the game here. *I managed it by installing Windows 3.1 through DOSBox, which is detailed here. You may also have to change your machine type in the DOSBox options file; I used "svga_et4000" and it works fine. Hiding anything from young children is difficult, for when no one is watching they have a way of getting into every nook and cranny of their ever expanding world. And so it was, that at the age of twelve you found an ornately carved wooden box hidden above the rafters of your farmhouse home. Intrigued, you examined it closely, from the intricate crown on the lid to the tiny lock that resisted your simple attempts to pick it. At last you replaced it where you'd found it, and continued the search for bird's nests and mice that had taken you there in the first place. It stayed in your mind, however, and you found yourself wondering, as you lay down to sleep at night, just what might be inside. Farm life can be hard, for there are always chores to be done, especially as the only child being raised by aging godparents. But there are joyous times as well, when the harvest is in, and life slows down to contemplate the splendors of autumn's beauty. And often, on those crisp autumn nights you managed to coax a story out of your godfather. Sometimes he would tell legends of the gods, wondrous tales of the battle between Thor and the giants, or the troubles caused by the trickster Loki. Other times he would tell of the days of his youth, when as a brave young warrior he had served in King Lifthransir's royal guard. But this night you had another subject in mind, for the carved box had been in your mind for days. "Grandfather," you said, for while he was not truly your grandfather he seemed as close as one, "what's in the box under the eaves?" His eyes opened wide, and he shot a look at your godmother who sat nearby. "Well," he said at last, "if ye be old enough to be askin', I guess ye be old enough to know. Why don't you fetch it here, child, and we'll take a look inside." Minutes later you watched with anticipation as he drew a fine chain out from under his tunic and used the small key that dangled from it to open the lock. Slowly he lifted the lid, and you caught a glimpse of gold reflecting the firelight. He reached inside and drew forth a finely crafted gold chain, with a circular pendant suspended beneath. "What is it?" you asked in a hushed voice, as you stared at the slowly spinning pendant glinting in the firelight. "A gift from your true father," he replied. "He came to us a dozen years ago, with the blood of a hundred wounds covering his body, and the awareness of his own mortality in his eyes. He handed us a small bundle, you as an infant, and collapsed on our doorstep. He awoke just once before he died, and asked us to raise you for him. He said the amulet he wore was to be yours on your eighteenth birthday. If you were worthy, he whispered as his voice failed, it would lead you to fortune and glory." You watched as your godfather gently lowered the pendant back into the box, and closed the lid. "And so, my child, you have much to live up to. Grow strong and wise, for the Norns have reached out and touched your life, as they do with few mortals, and I feel you will have need of all the talent and ability you can muster in whatever task lies ahead." Alright, let's make ourselves a character. The four stats are pretty self-explanatory, but unusually for the genre, they're not indicated by flat numbers on your status screen. Instead, we get bars, which start at half and can be raised up to 75% at character creation. You have enough available meter to push one stat up to 75% and raise another to almost that level. Gender doesn't have any effect on the game as far as I can tell, save for giving you a new icon. 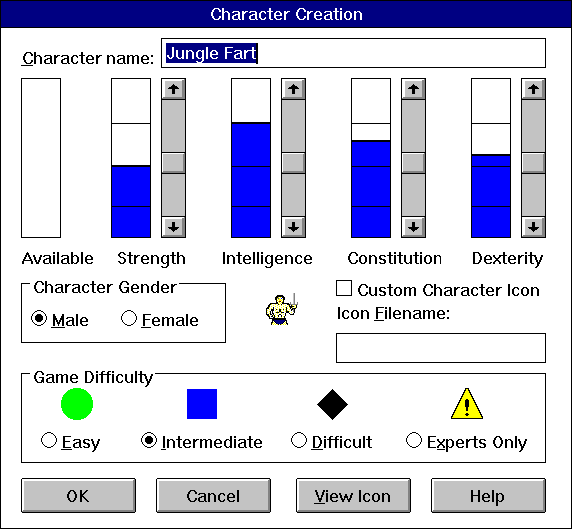 You can also utilize any other icon (.ico file) on your computer to represent your character. In my younger, dorkier days, I played through the whole game as a tiny 16-color sprite of Crono from Chrono Trigger. Finally, there's the difficulty, which is also pretty self explanatory. The default is intermediate; turning it up results in more monsters and rolls being tilted more in their favor, with the opposite being true for Easy. Of course, I'll be playing on the highest setting because that's how I roll. As for stats... I push Intelligence up to max so we can get more MP. That's because magic is the great equalizer in this game; melee combat tends to get you killed more often than not, unless the enemy you're fighting is significantly weaker than you are or you're very well armed and equipped. (Being on a high difficulty with the rolls tilted out of your favor certainly doesn't help with this either). Not to mention that very few enemies use ranged attacks, so you get to kill them long before they get a chance to kill you. ...It does result in a lot fewer deaths in the long run. Constitution is up next for more HP, followed by Dexterity to avoid a few more attacks. Strength I keep at a minimum since I plan to engage in physical combat as little as possible anyway. I should also point out that you can still cast spells when your MP is at zero or less. However, this does have a chance of causing you damage - sometimes even more than half of your HP - and it does take longer to recharge your MP to full when you sleep. So you should only do that as a last resort.